This guest post was written by Alethea Mshar out of concern for her son Ben. A version of this post originally appeared on her blog Ben’s Writing, Running Mom. Like all parents, my child’s health is very important to me. That’s why, even after getting an autism diagnosis for my son, I still believe in and advocate for vaccinations. 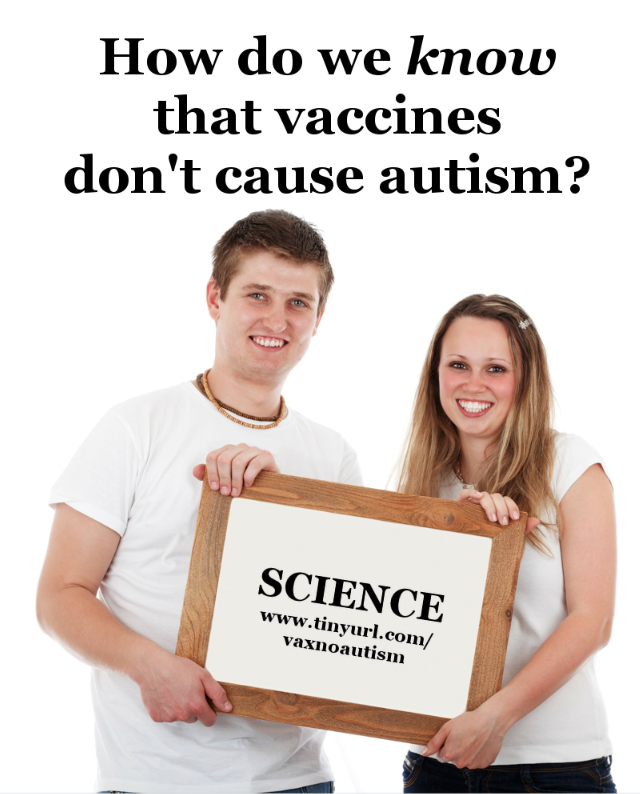 I don’t believe autism is caused by MMR or any other vaccinations. The allegations made by Andrew Wakefield, the man who tried to convince the world of an MMR vaccine-autism link, were based on falsified data, yet he continues to make his claim to try to frighten people throughout the world. This article by Brian Deer systematically addresses Wakefield’s flawed theories and debunks the autism myth that Andrew Wakefield has perpetuated. The science is clear, and yet there are many autism advocacy organizations that continue to install fear in parents who just want what’s best for their children. Alycia Halladay, chief science officer at the Autism Science Foundation, commends SafeMinds for financially supporting the study, but she worries that some autism advocates may be asking the wrong questions. “I’m not saying that we need to stop funding research in the environment, because we know the environment does impact neurodevelopment,” she says. However, Halladay explains that organizations that look to blame vaccines for causing autism are “playing whack-a-mole”. While there may always be people who will believe there is a link between vaccines and autism, despite the science that proves otherwise, I’m writing today to explain another issue that has swayed my decision to support vaccines. This issue is one of life and death for my son Ben. I realize, very clearly, that without vaccinations my son would die. That is why I am a fan of modern medicine and the science that makes vaccines possible. If Ben had been born a century sooner, he wouldn’t have survived his Hirschsprung’s disease. Had he been born less than a half century sooner, he wouldn’t have survived leukemia. As it is, we have come face to face with his mortality several times. I see vaccinations along the same lines as chemotherapy – far from perfect, but with the help of the scientific method, getting better all the time. Vaccines, and even chemotherapy in Ben’s case, are the best shot we have at giving our child a long, healthy life. Image courtesy of the Refutations to Anti-Vaccine Memes Facebook page. For us, though, it goes a step further. That means that even fully vaccinated, he doesn’t have enough ability to fight off diseases. He is that kid. The kid who needs herd immunity. He’s the reason our whole family gets flu shots and chicken pox vaccines. He’s the kid who needed boosters for pneumococcal vaccines – because his body lost immunity to them. 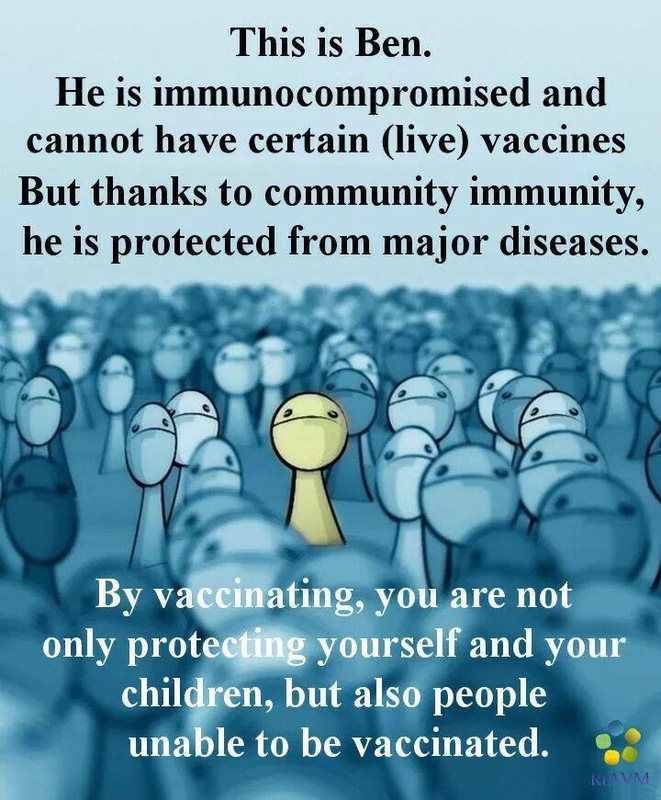 Even though we do our best to protect him, he’s the kid that could get infected during a measles outbreak. And he is the kid whose body is weak and who is very likely to succumb to a disease like measles, which would inevitably hospitalize him or worse…cost him his life. If you don’t vaccinate, have you researched the diseases we vaccinate against as well as the side effects of vaccinations? Have you seen what polio and diphtheria can do? Do you realize that if measles encephalitis sets in that your child will be isolated in the Intensive Care Unit while you wait to find out if he or she is the lucky one who survives with brain damage? And do you realize that, statistically speaking, the greatest risk in getting a vaccine for your child is driving your child to the doctor’s office? I realize the rhetoric goes around and around, and that I’m about as likely to change your mind as you are likely to change mine. But if there’s that tiny chance that you’re really considering all the facts, I’m hopeful that Ben’s face and plight would make a difference. After all, I am his mother, and I must do everything I can to protect him and keep him healthy. I have to try. I have a sad feeling that it will take a true epidemic to turn the tide. I just hope that my child will not end up as a casualty. He is not a statistic, nor would I ever want him to be one…he’s our precious child and we don’t want to lose him. So please remember, your vaccination status could mean the life or death of a child like Ben. Every Child By Two is collaborating with various immunization advocacy organizations to collect personal stories about the value of vaccines. These stories will then be shared with state and federal legislators throughout National Immunization Awareness Month (NIAM) in August. Help ensure that our government representatives know that our country, our communities, our students and our families deserve protection from vaccine preventable diseases. Join the movement and speak out in favor of vaccines by sharing your story at the following link: bit.ly/28NoZCR. I hope Ben stays safe. Thank you for speaking up. I am in the same position as your son here. Immune deficient and no, autism was not caused by vaccines. This world is scary right now and we need to change the language. We don’t call Down Syndrome damaged, so we should not call autism damaged either. A good resource for everyone would also include the Immune Deficiency Foundation, and I would not mind sharing my own story if you would like. Just let me know how I can submit it.
) to be applied to the test process and decrease the risk for rejection. Sorry, vaccines are proven bad. This was a huge mistake they did in the 50’s and had to dispose of. Sadly, they had to push it on people. This is being used to depopulate the world. Very rare that vaccine helps people,nevertheless, infants. Nobody ever mentioned here what the components of vaccines are. How it really affects your brain and body but, it is being pushed to be injected in your body. Not only this is alteration of the creation of God but, it destroys your natural immunity and the capacity of the body to produce its own antibodies. Yeah, more harmful fake medici es for you who has been brainwashed by the system. Wake up before it is too late. And yes, i am one of those vaccine victim, so please don’t give me baloney, that autism and vaccines are not related. Well, that’s a whole load of crazy right there……just the fact that we have the longest lifespans and highest standards of living in human history disprove your sad rant.